Our external environment is so dynamic and the feeling of uncertainty can become overwhelming at times. Uncertainty can stop you from moving forward. Certainty is a state of mind, like happiness. It is essential for leaders. When you have certainty, people backing you would buy into your vision, feel inspired and move towards the direction you show. You need certainty to create the life/business what you yearn for. How do you embrace uncertainty and convert it into excitement? You can tackle uncertainty at multiple levels. You need to note that certainty being a state of mind like happiness, need not depend on what is happening outside. When you play say foot-ball, you don’t expect the ball to come favorable to you always, rather you respond to it irrespective of the direction from which it comes. Uncertainty is certain when you take away your eye from the ball/goal. Instead of fearing the unknown future, you can get excitement with uncertainty. A movie is exciting when you don’t know the story/outcome. Similarly playing a game. what is controllable by others. Another way to feel certainty is through meditation and visualization. Meditation calms your mind and gives you time to listen to the inner voice. You can feel certainty through self-affirmations and by visualizing the end-outcomes with clarity. You can also use an NLP technique ‘Anchoring’ to put you into a state of certainty. In anchoring, you associate a past intense experience to an anchor such as a ‘Thumps up’ gesture and recall the same state of mind with that anchor. Another way is to have a spiritual mind-set. Surrender everything to God. Trust that He will take care of everything. Treat everything you do as a means to serve God. Several top executives and business owners, whom I have closely interacted with, are deeply spiritual. There are some tools you can use to get certainty. Getting clarity on your life purpose and goals is important for feeling certainty. Tools such Personal Scorecard and Business Scorecard can help you to get clarity on your purpose and goals; they help you to track your goals & lead measures and prompt you to take course correction. So these tools can give you predictability and certainty in your business and life. CXO Dashboards offers you simple but powerful dashboards, with which you can tackle uncertainty. To know more about how dashboards can give you certainty in your business, you can contact me at Thomas.MG@CXOdashboards.com. As you build organization bigger and bigger, one thing that is bound to happen is, people start speaking different languages. They use words that mean different things to different people. 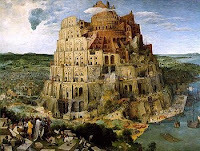 This is something similar to the Tower of Babel and it can stifle the growth of the organization. I have seen some organizations that do not have a common vocabulary about key measures. Otherwise how can HR, Finance, and Delivery functions report ‘Employee Attrition’ to the CEO three different figures using different ways of calculation. Similar is the case with ‘Manpower Utilization’ or ‘Residual Defect Density’ in IT Industry - different ways of computing the same metrics by different groups, functions or locations. For an organization to become aligned people should start speaking the same language, they should understand a few key measurements in the same way; what it means, how it is collected and how it is related to the business and their roles. Then the employees can co-relate the impact of their actions on the organization goals. It will also make the communication from the top management easier to understand. Lack of holistic view of the business processes is causing a lot of harm to the organizations. Even today, the processes for managing the most critical resources – people and their competencies - are very ad-hoc, fragmented and ineffective in several organizations. One of the best ways to get this alignment and energy to move forward in one direction is to implement a business performance measurement system. Balanced Scorecard is the most effective methodology today for doing that. With Balanced Scorecard approach, you start with your vision, mission, objectives, values, strategies, goals, and you arrive at the organization level metrics to be tracked. Then you cascade it to down to various functions and roles. Then every employee understands what they are accountable for and how their activities contribute to the overall business purpose. Balanced Scorecard methodology insists on developing a dictionary of all metrics definitions, and this is the foundation on which the dashboards are built. Try to build a dictionary of metrics applicable for each role in your organization; that will be a major step towards business alignment. To know more about how you can get business alignment fast using Balanced Scorecard approach, click on CXO Dashboards. Fix root-cause to cure multiple symptoms! Sometimes we come across doctors who treat for symptoms. After the medication period, these symptoms may reappear. Sometimes you will find the opposite: with one medicine multiple issues will vanish. This is true in business too. When I started my career as a programmer in TCS, the prominent programming language used was COBOL. We were using punch cards for keying in the program. We were allowed maximum 3 compilations before any program was compiled error free. Beyond that the issue would go to the Center Manager. Sometimes even one punching error, such as a hyphen missing in the Working-Storage section, could result in hundreds of errors. Fixing that one error used to eliminate those hundred errors. When I took charge as Quality Head in one organization, we wanted to pilot ‘Defect Prevention’ or ‘Causal Analysis’ in one project. We choose a project that was just starting the system testing. I was expecting about 8 to 10 errors in system testing and the intention of the causal analysis was to analyze the root cause of each defect, fix the root cause and eliminate a few categories of defects from the system. But the system testing gave me a surprise when the testing team reported about 800 defects. Then I realized even the basic processes were not working. We strongly enforced self-review and peer-review with a documented checklist at every phase, as an immediate solution. Once I called all project managers for a meeting and asked them to list all the problems they face to ensure quality. Again to my surprise, there were 47 unique problems listed. I realized that if I started working on those problems sequentially, it could take several years. From my previous experience, I knew that several problems related to project management and quality can be eliminated if we go for process automation. That was the time when we took a decision to go for an enterprise wide project planning and defect tracking tool. Even after decades of Quality movement, some organizations are struggling with several operational issues. Think of a situation where everybody in the organization knows their purpose, their responsibilities and goals. Assume they are excited about it and have a mechanism to track it; they are working towards achieving the overall organization goals and objectives. In this scenario, it is not difficult to imagine that several classes of issues will vanish from the organization. That is why, several large organizations that implemented business performance management systems continue to thrive even during recession. If you are finding several performance related problems, you could look at Balanced Scorecard as a solution to several classes of problems your company is facing. This is a case study of developing a Business Scorecard for a small organization and is a continuation of the previous blog on Balanced Scorecard for SMBs. I met the CEO of the organization and his core team and gave an orientation about the Balanced Scorecard. I had circulated a questionnaire a few days before the meeting. We had about two hours of discussion about the vision, mission, challenges, strategy, and the goals etc., about the company. We brainstormed about a few initiatives that would help to achieve his goals and objectives. After the meeting, I spent a day or two reflecting on his requirements and designed a Strategy Map and a Scorecard according to the Balanced Scorecard principles. I had one more discussion with my client to refine the Scorecard. We identified the metrics that need to be tracked monthly; it has metrics related to the four perspectives: Financial, Customer, Internal Processes, and Learning & Growth (Capabilities). We also identified and prioritized the initiatives. The key challenge in this project was identifying the critical few measures that must be tracked, especially the non-financial measures. Now the organization has a one-page document that gives crystal clear clarity on the vision, mission, objectives, goals, strategies, measures and initiatives and also a tracking sheet for tracking the measures monthly. It is true that because of this initiative, the CEO has to spend about half-an-hour weekly tracking his Scorecard (anyway this is a key activity based on the 80/20 rule, where 20% of activities create 80% of the output). Some initiatives have to be completed and a few processes have to be set right before the organization see tangible business benefits from the Scorecard implementation. What is interesting to note is that it took only a few hours of the CEO’s time and less than a week to create the Business Scorecard. Now he has a one-page scorecard to track what’s all important for him (not just the financial measures). This gives a tool for intensely focussing on his strategies and executing as per his strategy. This eliminates the need to track various Excel files and filters out some measures that need to be tracked only at the next level. This empowers the next level team to act on operational issues with ownership, because they also know the numbers they are accountable for, in the overall business context. Balanced Scorecard has been used by large organizations for transforming their business. They used to spend millions of dollars and several months/years for implementing Balanced Scorecard. In this context, it comes as a relief that even small organizations can benefit from this methodology with an investment of a few hours and can see results coming out in weeks. To know how to create a Business Scorecard for your Business or Function, please visit http://www.cxodashboards.com/.